Prettyfulz: Weekly Nail Blog Round-Up! Stacie from KawaiiNailArt had the great idea to do a Weekly Nail Blog Round-Up to feature our favorite nail art designs from the current week. If you wanted to be a part of the weekly round up click here. Jen showed us how to use our Konad plates in a more inventive way with this manicure. Stacie was in an angelic mood this week with her angel wing manicure. 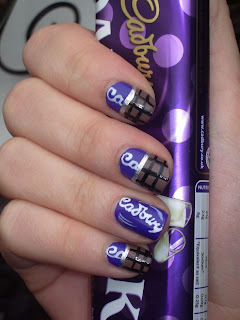 Emily let her chocolate tendencies get the best of her with these Cadbury Nails that look good enough to eat! To celebrate her starting a blog Claire is having an OPI Giveaway. Shella was inspired by furry creatures and this lovely little bear manicure was the result. Last but not least, For Your Nails Only's Spring Flowers free hand painted nails! And I am pretty sure you are already familiar with my butterfly manicure. If you haven't already here is another look- & I recently went back and made a tutorial so be sure to check that out! I'm loving them all....Jen's is definitely my favorite!!! So colorful! Prettyfulz--I got news for you on my blog. Go see! *Cherish~ Ahh I saw it! You are soo quick with these updates!!! Just posted about them .. Pastel Colored Pedicure Nail Art Design! BUNDLE MONSTER IMAGE PLATES NOW ON SALE!!! 2 more New Bundle Monster Plate Releases!! Spring Flowers Nail Art TUTORIAL!! Oh My GOSH HOLOGRAPHIC & New Polishes! 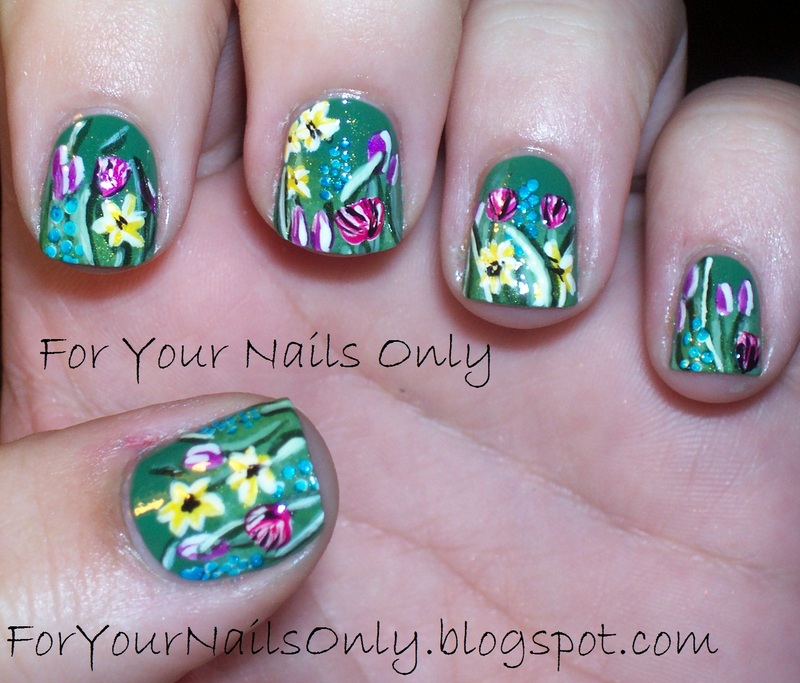 Spring Flower Nail Art Design & Poll Results!